Booking Mama: Review: Can I Get an Amen? Growing up, Ellen Carlisle was a Christian: She went to Jesus camp, downed stale Nilla Wafers at Sunday school, and never, ever played with Ouija boards. Now, years later, when infertility prevents her from giving her ambitious attorney husband a family, she finds herself on the brink of divorce, unemployed, and living with her right-wing, born-again Christian parents in her suburban New Jersey hometown. There the schools are private, the past is public, and blessings come in lump sums. For some reason, I seem to be reading a lot of light reads this summer. I expect that it has something to do with having both kids at home and spending a fair amount of time by the pool! One cute book that I read a few weeks ago is CAN I GET AN AMEN? by Sarah Healy. This debut novel is both funny and touching, and the early praise for the book is terrific. CAN I GET AN AMEN? has cover blurbs from Janet Evanovich, Emily Giffin, and Lisa Scottoline! CAN I GET AN AMEN? tells the story of Ellen a woman who is certainly down on her luck. Not only has she been facing fertility issues, but her marriage has fallen apart partially as a result of all the stress and she is unemployed and out of money. As a last resort, she moves back in with her very conservative, very Christian parents as she tries to get her life back in order. Ellen quickly realizes that it's not going to be easy... to start over or live with her parents. Ellen's mother has very strong faith and truly believes that God will take care of her... if Ellen would just start going to church. However, Ellen has different beliefs from her mother and tries to find solace in other (less healthy) things. Ellen eventually begins to turn things around when she gets a job working for her high school frenemy's husband and she meets a terrific guy, but she finds that neither of these things are exactly what they seem. To find happiness, Ellen has to learn many lessons about life including how to first believe in herself. Overall, I have to say that I was a bit surprised by CAN I GET AN AMEN? I mean that in a good way, though. When I initially saw the cover for this book, I thought it looked like a chick lit type book (not that there's anything wrong with that.) 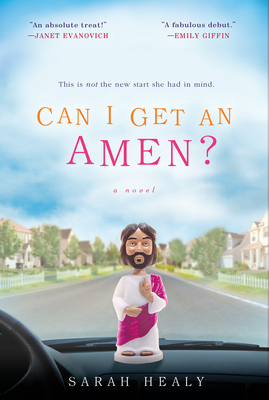 I actually laughed at the creepy little Jesus bobblehead on the cover. However, CAN I GET AN AMEN? actually was a much deeper novel than I was expecting. This book delved into a troubled woman's life and explored some very serious issues including infertility, divorce, and faith. I was impressed with Ms. Healy's writing and I think CAN I GET AN AMEN? is a great debut effort. Her writing was very polished and I appreciated her character development. I thought she did a great job in creating some very interesting characters, and by that I mean Ellen as well as her brother, sister, and mother. In addition, I loved how she explored some complex family dynamics. In fact, I think many readers will be able to relate to one of these characters personally or at least know someone who has similar traits. I found it interesting to learn that Ms. Healy grew up in a home similar to Ellen's. I don't know how much of this story was autobiographical, but I can assume that many of Ellen's feelings about religion and her parents were things Ms. Healy understood very well. And that's one of the reasons that this novel was so special -- Ms. Healy brought an honesty to many of the issues in this novel from the divided family to the journey to self-discovery; and the book just seemed more real as a result. And that brings me to my next point... one of my absolute favorite parts of this novel was how it explored Ellen's (re)discovery of faith. And I don't necessarily mean faith as it pertains to religion. Rather, I mean faith in herself. There is no doubt that this novel does explore faith and what it means to different individuals (and I did find that very interesting), but I also liked that Ellen's journey was extremely difficult for her. In many ways, CAN I GET AN AMEN? was a coming-of-age story for Ellen, and I think that the pain she experienced along the way made ultimately made her a better (and healthier and happier) person. CAN I GET AN AMEN? would make a great book club selection; however, I wasn't able to find a formal discussion guide. While parts of this book are very entertaining and fluffy, there are some serious topics which might warrant some further discussion. Some of the themes you might want to explore include family dynamics, infertility, marriage, commitment, sibling relationships, Christianity, forgiveness, faith, and redemption. I enjoyed CAN I GET AN AMEN? and was pleasantly surprised by the depth of this novel. Recommended for fans of women's fiction. I thought this was Christian fiction, so I'm glad I read your review. I imagine there are a lot adults trying to adjust to living with their parents again these days. The book sounds great! Yes, it's strange how the cover of a book automatically affects our expectations.